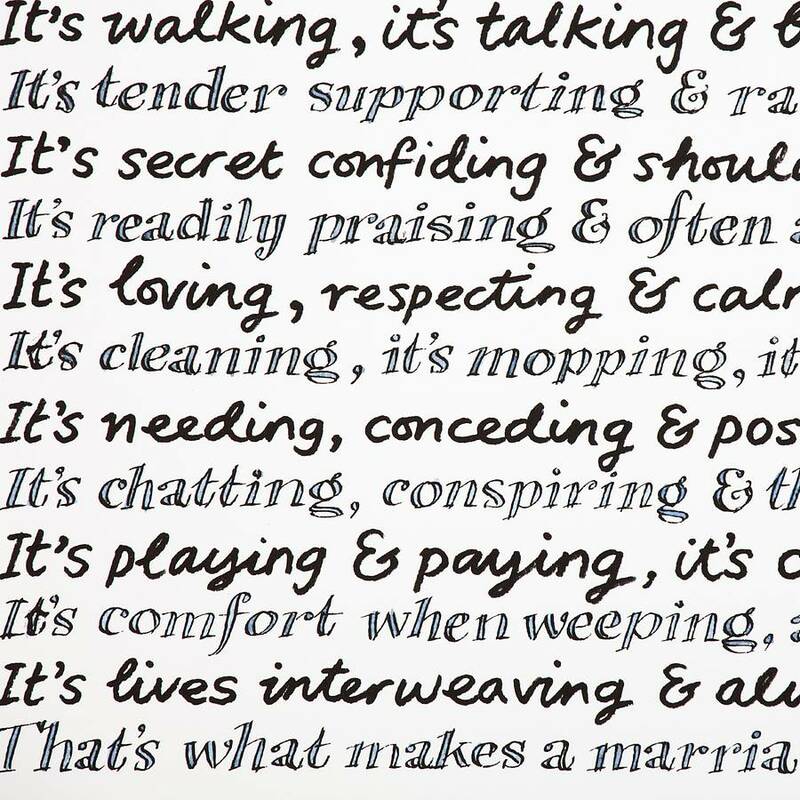 A witty, heartfelt marriage poem which explores the extraordinary and everyday aspects of being in a relationship. 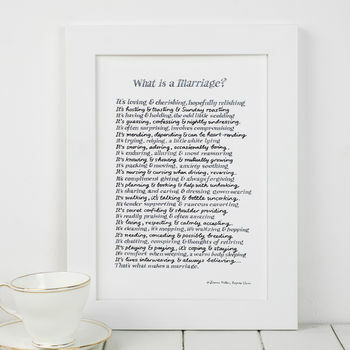 Our funny, honest and moving marriage print makes the perfect gift for weddings, anniversaries and valentines day. 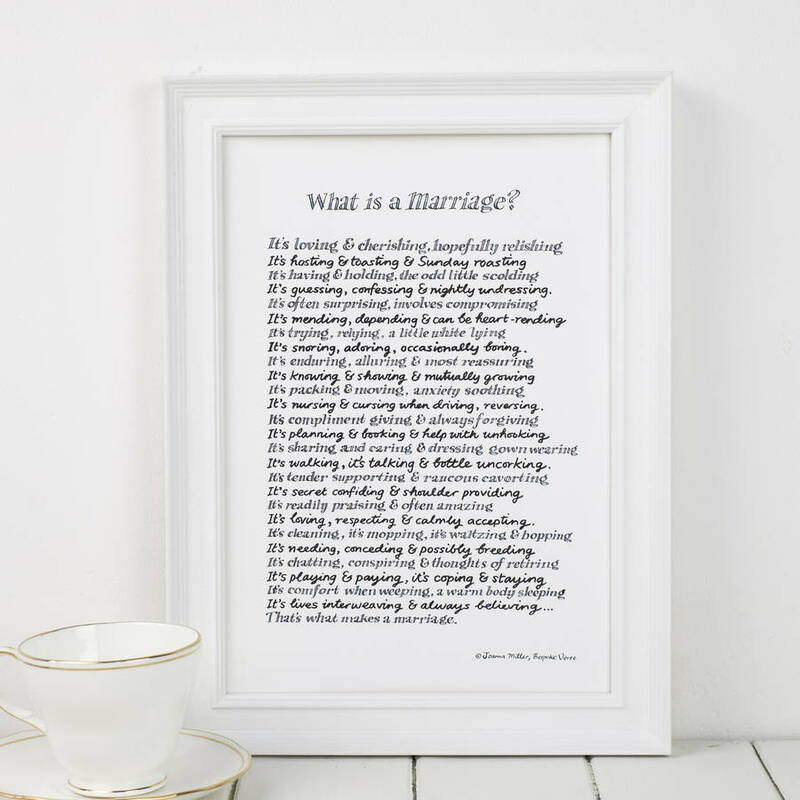 It is also suitable as a reading at a wedding ceremony. 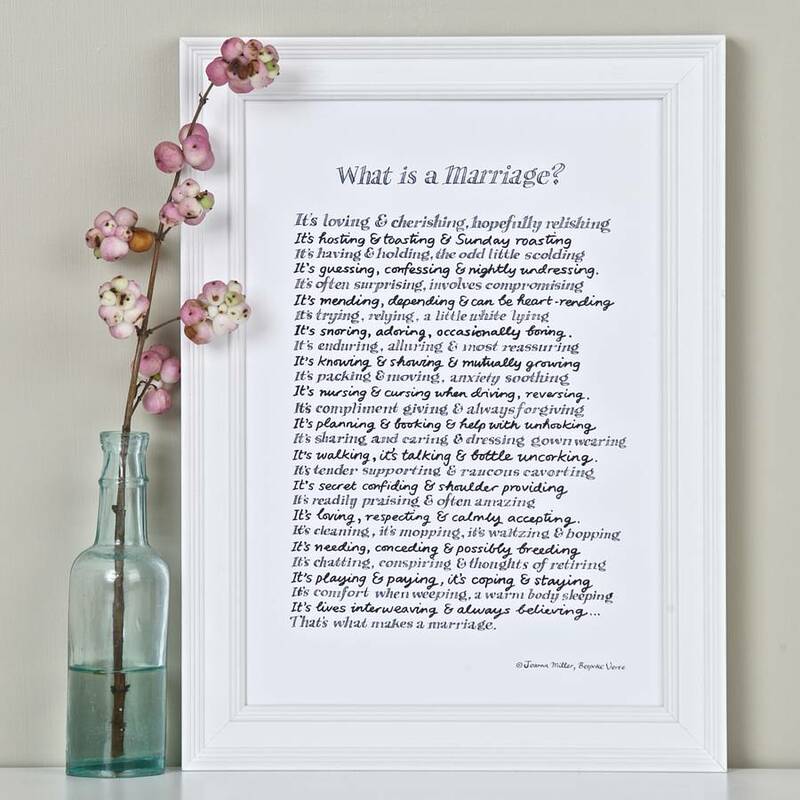 The poem was hand inked by artist Peter Gander (no computer fonts here) and the A4 print is a glicee (or high resolution) reproduction of the original. 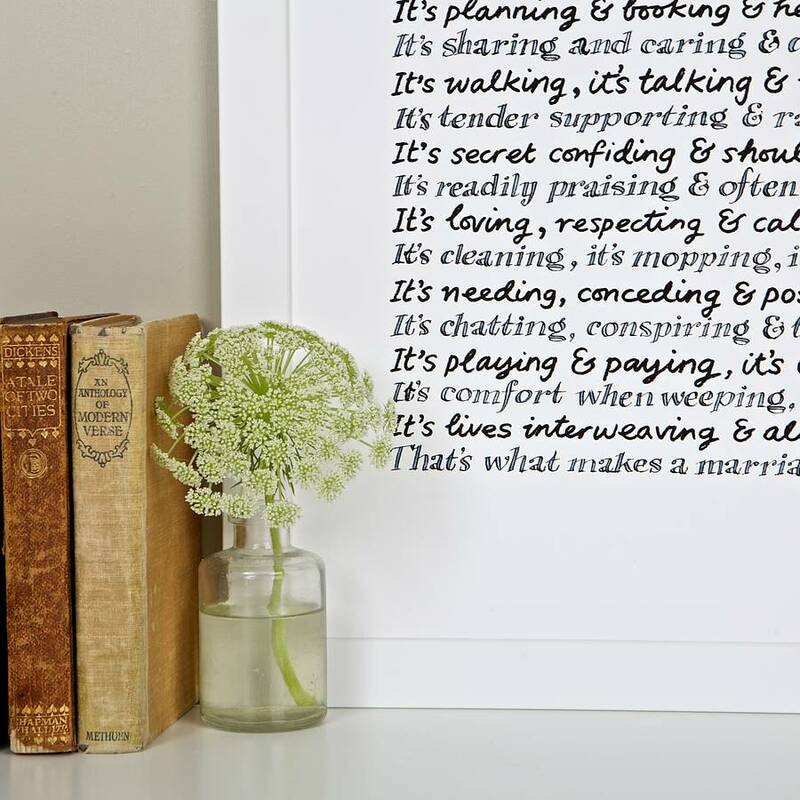 You can purchase the print unframed or framed in one of our two white A4 frames. 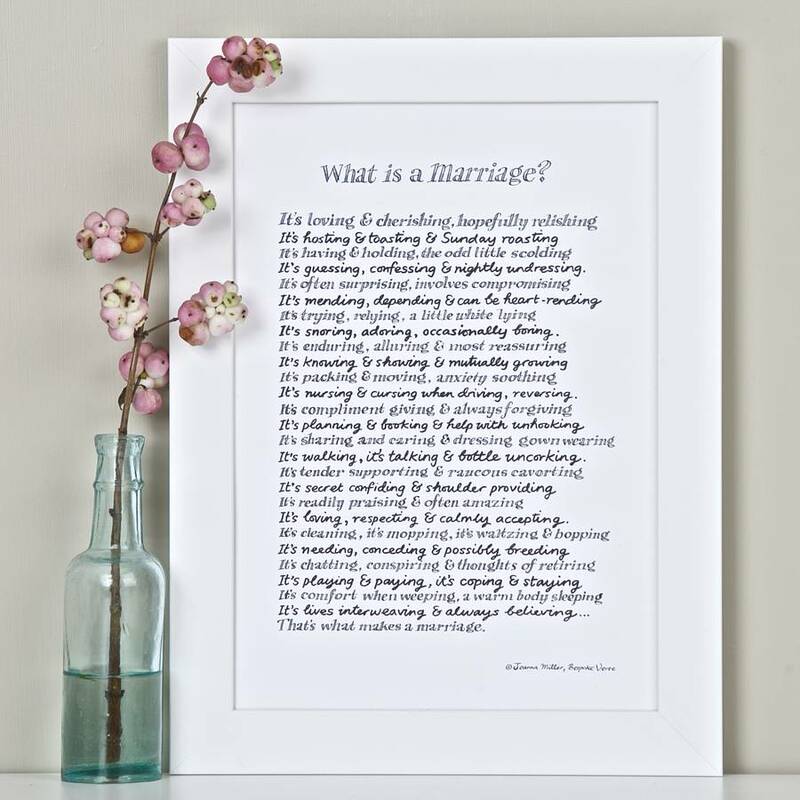 Written by Bespoke Verse poet Joanna Miller, this poem has featured in magazines such as 'Wedding Ideas' and 'Unique Bride'. In 2013 Joanna won the Wedding Industry Experts award for 'Best Wedding Writer'. 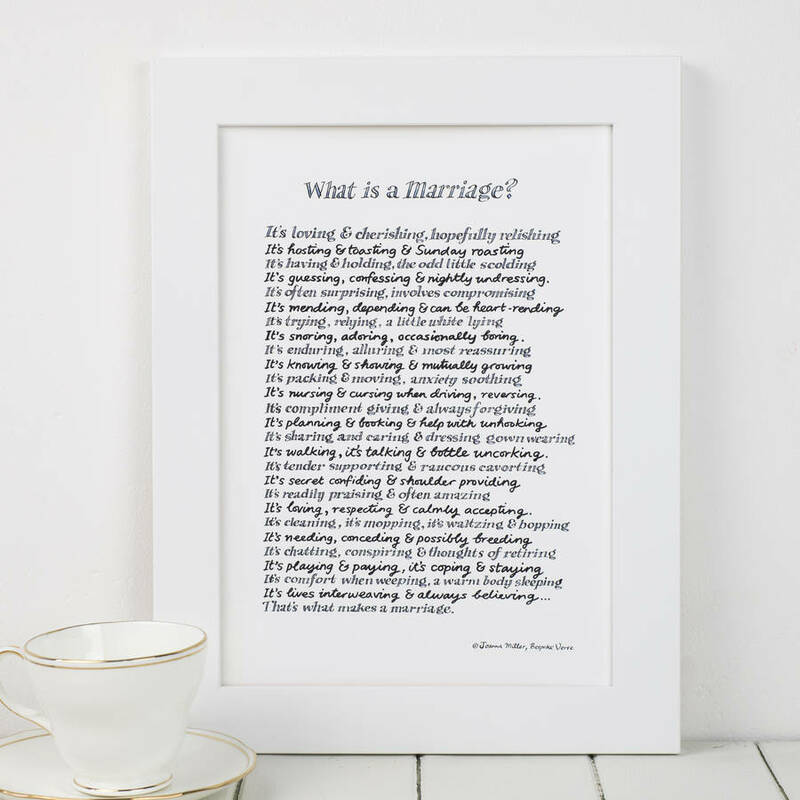 Whether it's snoring, Sunday roasting or shoulder-providing, everyone will recognise the range of shared experiences and feelings 'What is a Marriage?' describes. It’s loving & cherishing, loyally relishing. It’s hosting & toasting & Sunday roasting. It’s enduring, alluring & most reassuring. It’s trying, relying, a little white lying. It’s knowing & showing, & mutually growing. It’s packing & moving, anxiety soothing. It’s having & holding, the odd little scolding. It’s nursing, & cursing when driving (reversing). It’s compliment giving & always forgiving. It’s planning & booking & help with unhooking. It’s sharing & caring & dressing gown wearing. It’s tender supporting & raucous cavorting. It’s secret confiding & shoulder providing. It’s readily praising & often amazing. It’s loving, respecting & calmly accepting. It’s needing, conceding & possibly breeding. It’s chatting, conspiring & thoughts of retiring. It’s playing & paying, it’s coping & staying. It’s comfort when weeping, a warm body sleeping.